Cupcake Chipboard Coaster Book is a board style alterable album and is perfect for your next gift or project. Each book has 8 pages made of thick chipboard, the first page die cut, which makes them easily alterable and/or paintable. 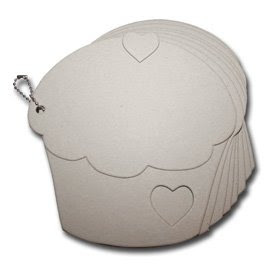 The Cupcake Chipboard Coaster Book measures 6.1" x 5.9" and comes with chain and packaged in a clear hang bag. Inque Boutique new arrivals for Jan2009!